Dynamics 101 recently compiled a list of the top 50 SharePoint Blog sites.I’m very honoured that my blog site made the list, and humbled that the community feels that my site contains such useful SharePoint information. Thanks for the recognition. This list got me thinking… how can people best utilize these resource sites? I’m sure that there are some of you out there that are already subscribing to or monitoring these sites to stay ahead of the latest SharePoint news. For those not quite at this stage yet I have the following tip. Get new content delivered directly to you from the Top 50 SharePoint sites as soon as they are published… for free! The “magic” we are going to use to make this happen is actually fairly old technology, RSS feeds. I haven’t checked all 50 sites on the list but most (if not all) support RSS feeds. What this means is that the site exposes a list of articles as they get published on the site that you can subscribe to. This subscription mechanism is standards based (RSS). This means you can use any RSS compliant client application to receive the feed. There are many popular RSS feed readers available (and lots of them are free). But since I spend much of my time in Outlook I’m going to show you a seldom used feature of Outlook – it actually has a built in RSS feed reader. 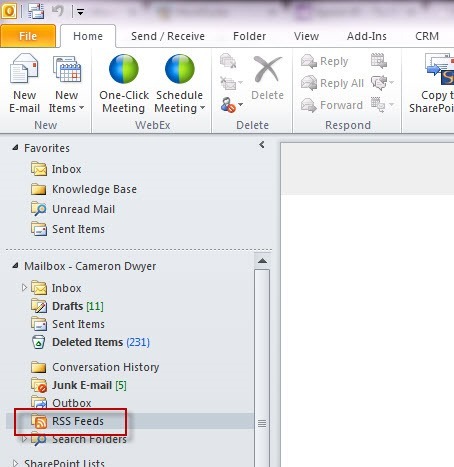 If you already use Outlook for email, you don’t have to worry about starting up and checking a separate application for reading RSS feeds. It’s familiar – blog articles delivered by RSS feed look and feel very similar to receiving email messages. They are stored in special Outlook folders (with an unread count), individual articles look like email messages with a title, date, source, and you can read them in preview pane or open them full screen just like reading an email. Article content can be stored in your Outlook pst file so it’s available offline to read in your downtime. [My favourite feature] – You can assign follow up tasks and notifications. So if you see an article come in that you really need to do something about set a follow up task next week (by right-clicking | Follow Up | Next Week) and Outlook will remind you about it in a weeks time when you have long forgotten about it! 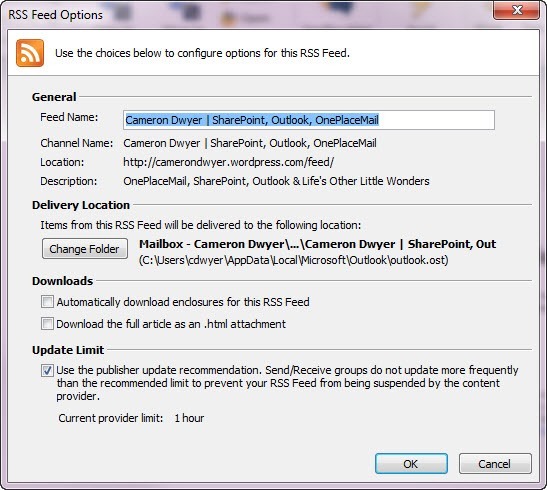 There are several ways to add RSS feeds to Outlook (including directly from browsing a site in IE). The method I’ll use here is a bit more manual but it works in more scenarios and gives you more options and is probably the most reliable method. Find the RSS feed icon and click on it. The icon is usually orange in color and looks fairly similar on most sites (below is a screenshot of the RSS feed icon on this site). Clicking on the RSS feed link should take you to the actual feed URL. The formats vary widely as to what this will actually look like. Keep in mind this is for the feed reading client to make sense of, not you. Copy the URL to the clipboard and then switch back to Outlook and we will add this URL as a new RSS feed. You can now click Yes to complete the process or click Advanced… where you have the opportunity to set more options regarding the consumption of this feed. 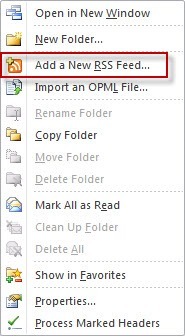 Once you’ve added the feed you should see a new folder under RSS Feeds in Outlook. New articles from this feed will be delivered directly into this folder (just like email arrives in your inbox).